The animal training industry is unfortunately not a regulated industry. This means, that there are a lot of “trainers” out there that have absolutely no formal qualification. Anyone, can describe themselves as a “animal trainer”, “dog trainer”, “dog whisperer”, or “animal behaviourist” without actually having any credentials. Choosing a trainer can be one of the most important decisions you make in your pet’s life. Just think, the techniques that you are taught to use, are going to affect how you interact with your pet for many years to come. Training should be fun, for both you and your pet, and you should build a healthy bond with each other. You should both actually want to spend time with each other, and your pet should want to work for you, not because of what might happen if he or she doesn’t. So, what should you look for when choosing someone to assist you and your pet? You need to look for a trainer that has a qualification, and can prove it. Not just say “oh I have a couple of certificates”, or “I grew up with dogs my whole life”. It’s like saying, I grew up in and around cars my whole life, I can drive it, I can put petrol in, check the oil and change a tyre – so I’m a mechanic…. Right? What continuing education do they have, attend or present at? Let’s be honest, if your cardiologist graduated 30 years ago, but hasn’t attended or participated in continuing education, how comfortable would you be in their care? What books, websites or Facebook pages would they recommend that you access, read or follow to further your own education? What method of training do they use? A trainer that uses reward based training is what you are looking for. When training an animal you want to focus on using something that motivates and rewards them for doing the right thing. This is most often food, but can be praise, play or pats as well, rather than using techniques that use fear or pain to punish the non-desired behaviour. These include hitting & kicking, squirting, zapping, choking (check chains), prong collars, alpha rolls, scruffing, screaming, throwing things at them etc. Research has repeatedly shown that dogs do not need to be physically punished to learn, and that there are actually risks associated with using these physical punishments, that include slowing learning, increasing fear or causing aggressive events. You can even get tricky and ask the potential trainer which of the 4 quadrants of operant conditioning they use. If they have a qualification or have done any research they will understand this. You are looking for a trainer that predominantly is based in Positive Reinforcement. That saying, we do also use Negative Punishment. Let me explain that a little better. Positive in the training sense means the addition of something, and reinforcement is something that will likely cause the behaviour to occur again. So generally we ADD (food, praise, pats or play), and REINFORCE the desired behaviour. Negative Punishment, means that something is taken away, and the result is the behaviour is less likely to be performed in future. If this is used correctly, immediately after the negative punishment, a desired behaviour will be able to be Positively Reinforced. An example. Your dog jumps at you to greet him but you would really rather he sit. Instead of pushing on him, hurting him by squeezing paws or kneeing, or even yelling at him “get down”, instead you take your attention away by crossing your arms and looking away (that’s the negative), and the jumping behaviour is less likely to continue because it is no longer being rewarded, the dog gets down. You immediately ask the dog for a sit, and as soon as he does, you give him a treat (that’s the positive) and in future, your dog is more likely to greet you by sitting, than jumping. How many years has the trainer been working in the industry? In a class situation, how many dogs per class per instructor? Ideally classes should be small, this helps the owner (you) gain the most, the dog not become too over stimulated, excited or stressed. A good ratio is 1 instructor for a maximum of 6 dogs. I actually prefer to keep my classes smaller at a 1 to 4 ratio. This doesn’t bring in the same monetary value, however, it does give all involved a better experience – which in my opinion is what really counts. 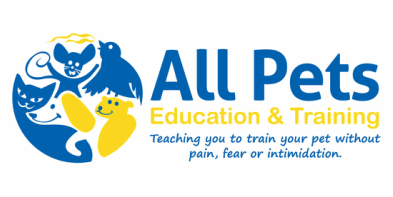 What vaccination or health protocol does the trainer wish to see before allowing dogs to be in class with other dogs? Vaccination or titre testing is important for the core diseases (Distemper, Hepatitis, Parvovirus – these 3 kill). You should also consider vaccination for the canine cough. Dogs that are ill should not attend class, just as children that are ill should not be at school. This is important in all classes, however it is particularly important for puppy or kitten preschool classes where the immature immune system of your pup or kitten is not maximally protected against disease until 2 weeks after their final puppy or kitten vaccination protocol. 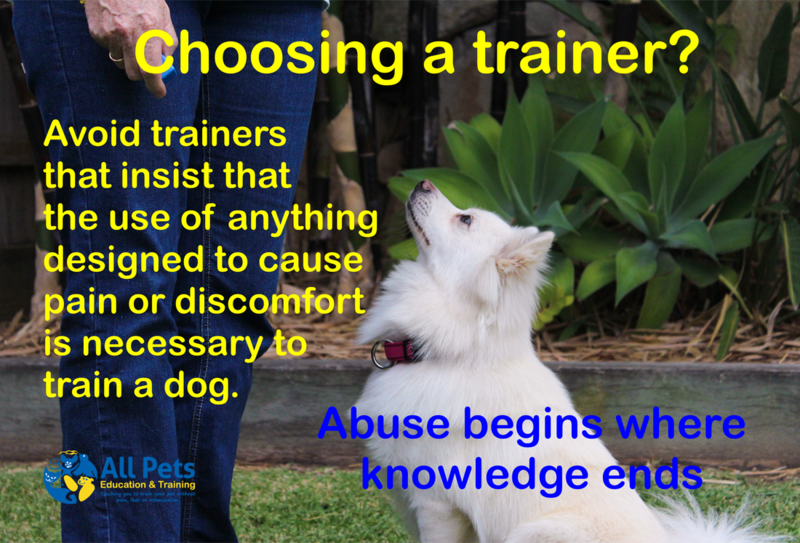 Is the trainer comfortable referring and or working with your veterinarian or veterinary behaviourist? Not all behaviour changes are behaviourally based, many of these have a physical medical cause. A good trainer will be able to recognise that perhaps not all is as it seems and be able to recommend veterinary attention. Just like humans, some pets will also require medication for help with behaviour problems including anxiety and fear. This is something that needs to be diagnosed and dealt with by a veterinarian experienced in behaviour, or a veterinary behaviourist. If you are considering a class situation, can you attend a class to observe (without your dog)? If the trainer says no, I would be concerned, unless they can give you a valid reason. When you do observe the class look for the following. Where are their tails, are their bodies loose etc. How are they interacting with their dogs? Is everyone enjoying themselves? Do they look bored? Does the instructor treat not only the pets with respect but also the owners? Does the instructor have a plan? Classes should be planned in advance – and skills and lessons planned for each week. However, a good trainer will also adapt classes or exercises to suit individual students or clients. What are their teaching skills like? A trainer that is good at what they do, will explain what the behaviour is that they are training, why it should be done, and also be able to demonstrate it. They should be able to adapt the exercise to suit individuals and should allow time for the entire class to practice each exercise. They should also assist each client and pet individually to ensure that the exercise has been fully understood. Pets are constantly changing and variable. Honestly, could you guarantee that your three year old son, will be a well-mannered, responsible, 30 year old. Or could something occur in his life that results in things not running so smoothly. For example something happens, he mixes with the wrong crowd, gets into drugs, or something occurs to frighten him (such as a hold up at a petrol station) and results in PTSD, or he becomes anxious and fearful. From fear develops aggression. A trainer that says Dominance is the cause of the problem and Leadership is the solution. Dominance has been scientifically debunked, however unfortunately many trainers have trouble letting it go. A trainer that says that they use positive reinforcement, but doesn’t believe in food as a reward. Describes themselves as a balanced trainer. This means that they believe in the use of physical punishments or equipment designed to be aversive, as well as rewards. Remember what was said early about physical punishment. Is vague in their answers, or becomes abrupt and rude when asked about their methods. A good trainer has nothing to hide, and is more than willing to spread the word on reward based training. 4pawsu.com. (2012). How to Choose a Dog Trainer. [online] Available at: http://4pawsu.com/trainers.htm [Accessed 8 Jul. 2016]. Anon, (n.d.). [online] Available at: http://avsabonline.org/uploads/position_statements/How_to_Choose_a_Trainer_(AVSAB).pdf [Accessed 8 Jul. 2016]. Apdt.com.au. (n.d.). APDT Australia - How To Choose A Trainer. [online] Available at: http://www.apdt.com.au/trainers-directory/how-to-choose-a-trainer.html [Accessed 8 Jul. 2016].